Share the #love with your customers for #Valentines Day. 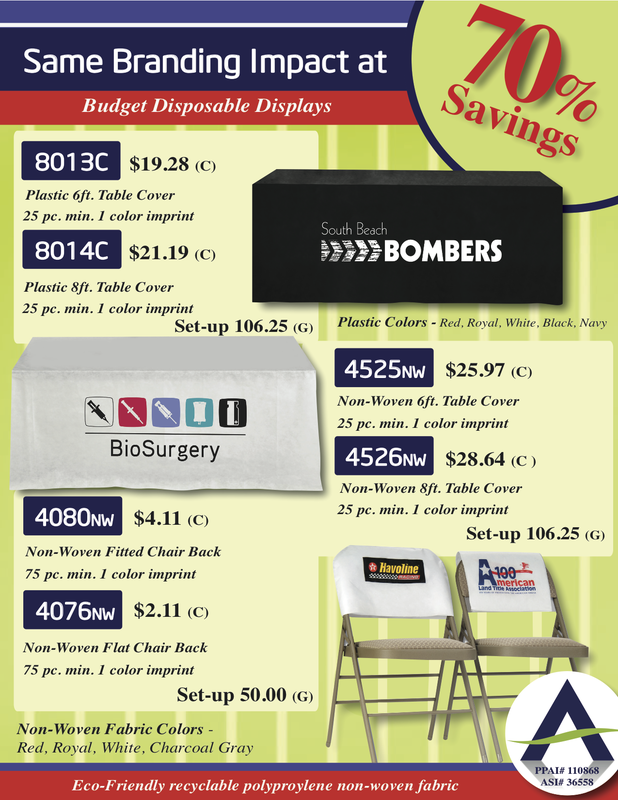 Show-off your display table cover sales impact. Check-out the largest selection of disposable event display table covers. Enjoy up to 70% savings on these high impact branded logo offerings! Budget disposable products are made from eco-friendly recyclable polypropylene non-woven fabrics. Place your order and start the extra savings today! Why: Expand brand recognition, introduce new service & consumer related depts. We love offering quotes to our Promotional Product Distributor Partners! 1) A custom 60 x 102 Digital Table Cover – 2500 pieces. This is for a supermarket chain who is offering a sampling introduction. Which one? Does it matter? How many supermarket chains are close to you? 2) Cool Wraps (For your head – to stay cool) – 2500-9500 pieces. Summer is coming. Just like the seasons to come and go. The chilly and snow-filled winter is a memory (for most of us) and we will soon be looking for ways to stay cool in the heat. Are you looking ahead with your customers? 3) Our Bib Apron styles #3011 & #3016 – 1200 pieces. Uniforms are always instyle. Whether it is retail, or home improvement stores, or restaurants – they need fresh and sharp-looking uniforms – on a budget. Aprons are a natural. 4) Style #3100B – Button Vest – 1,000 pieces in assorted sizes from S – 5XL. Read the above. Uniforms are needed everwhere. Who buys uniforms for their employees in your complete territory? Look at every client you have or no longer have. Do they need an updated look? These are just a few of the recent quotes we have given to distributors in the past two weeks. The large customers are out there. Yes, you might have to work with more persistence to get that appointment. Yes, you may have to put on your creative hat to offer them suggestions (Hint – we do custom sizes on many of our products based on Your Customer’s specifications). Yes, you might have to work a little smarter, negotiate a little better, communicate a little stronger. But you, too, can be part of the burgeoning growth of the Ad Specialty Industry (meaning – getting out of that stinking economy). We also have other quotes. With numbers not so large which we also like to get. Sometimes they’re easier and quicker to produce. Sometimes they are not. But we do like them all. Some of these quotes are now orders. Where are your quotes?